Next stop www.apartmenttherapy.com to see examples of how to hang these adorable, charming plantlets and to learn their historic connection to bonsai. 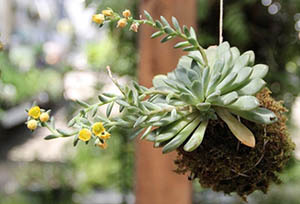 Speaking of which, www.cutebonsaitree.com has more neat images of kokedama. There are good tutorials at www.makezine.com, and http://blog.freepeople.com. At http://atelierchristine.com, there is an 8 minute long video from Japan to watch and at http://pinterest.com many people show off their favorite hanging gardens. www.youtube.com offers Aussies making string plant gardens. www.gardendesign.com magazine has two articles on the topic and both point us to the brilliant work of Nederlander Fedor Van der Valk. Count on the Dutch to take this to the next level at www.stringgardens.com. Inspired? You have enough information to try this on your own, or join the Virtual Gardener at the Kokedama class offered on January 18th at The Frelinghuysen Arboretum.